A Web of Prevention provides a timely contribution to the current debate about life science research and its implications for security. It is an informative guide for both experts and the public. It is a forward-looking contribution covering both ends of the equation and creates momentum for the current discussion on effective preventive measures and effective control measures. While there are no guarantees for preventing misuse, there are nonetheless crucial steps the world community can take towards the overarching goal of a global network for the life sciences. This book sheds light on concrete steps toward the achievement of this worthy goal. From the Foreword by Dr Gabriele Kraatz-Wadsack, Chief, Weapons of Mass Destruction Branch, Office for Disarmament Affairs, United Nations. 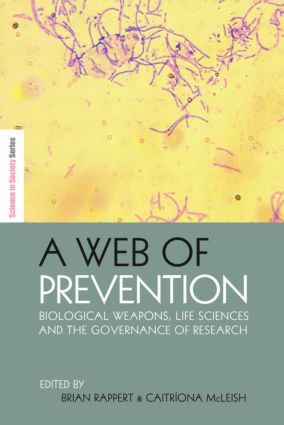 This book with its collection of essays provides an in-depth analysis of the various mutually reinforcing elements that together create and strengthen a web of prevention - or of assurance - that is vital to ensure that the advances in the life sciences are not misused to cause harm. All those engaged in the life sciences and in policy making in governments around the world should read this book so they can take steps to strengthen the web preventing biological weapons. Dr Graham S. Pearson, Visiting Professor of International Security, University of Bradford, UK and previously Director-General, Chemical and Biological Defence Establishment, UK Since September 11, 2001 in many countries renewed attention has been given to how research in the life sciences might inadvertently or intentionally facilitate the development of biological or chemical weapons. This state-of-the-art volume examines the full extent of the issues and debates. Coverage includes an overview of recent scientific achievements in virology, microbiology, immunology and genetic engineering with a view to asking how they might facilitate the production of weapons of mass destruction by state, sub-state or terrorist organizations. Consideration is given to what we have and haven't learned from the past. Employing both academic analysis and reflections by practitioners, the book examines the security-inspired governance regimes for the life sciences that are under development. Ultimately the authors examine what is required to form a comprehensive and workable web of prevention and highlight the importance of encouraging discussions between scientists, policy makers and others regarding the governance of vital but potentially dangerous research. Brian Rappert is an Associate Professor of Science, Technology and Public Affairs in the Department of Sociology and Philosophy at the University of Exeter (UK). Caitr?ona McLeish is a Fellow in SPRU, Science and Technology Policy Research at the University of Sussex (UK).